Ever have one of those days where everything is perfect? The weather, the company, the location, and activities. You look back at the end of the day, tired and happy, and think “wow, this is a day I will always have with me! This is a day that makes all the difficult things of life worth it.” As much as we would like to, these days cannot be planned. They just happen organically. That’s part of what makes the day so special; you just can’t put a finger on exactly how it happened or even why it ended up being so unique. It will never be recreated other than in your mind again and again during the mundane or hard times in life. The Jersey Shore. I’m sure for a lot of you, when you read these two words, a certain TV show comes to mind. While this is a reality for some, I am talking about the G -rated Jersey Shore. The Jersey Shore of families. The Jersey Shore of sun and beach and waves. 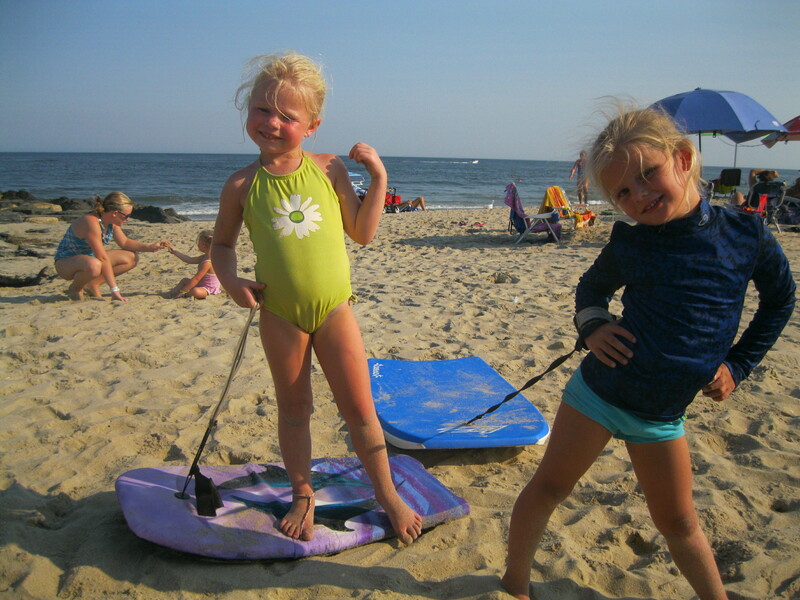 Of laughing kids and boogie boards and sandcastles. You know exactly what I am talking about if you have grown up in New Jersey. Grown up near any ocean. It’s a privilege that many know nothing about. I grew up in the Mid West. No oceans there! I tried to explain to my children how lucky they are to live just an hour or so from the ocean when so many kids their age have never seen the ocean. They didn’t understand because they know nothing different. It’s no big deal to go to the Atlantic Ocean, just another fun day. At least I had the Great Lakes, some people do not even have that, but it’s still just not the same. It’s the salt and tides and the mystery of another land on the other side of that great body of water (I know. The Great Lakes have Canada but still, just not the same!). Let’s face it, it’s even those unseen sea creatures lurking in that great body of water that adds a scary excitement to a swim (especially after Shark Week!). It all came together so quickly. Friends of mine were on vacation for the week at the shore. They invited us to come down for the day. The day before going I was at a friends lake, planning the upcoming year’s events for a club we run, while our kids played and swam (I highly recommend this kind of meeting! It’s the best!). Another friend said she was thinking of taking the kids to the shore for the day, one last hurrah! I mentioned that we were going. Later that day a different friend called to see if we could get together sometime over the weekend and as we were talking we both realized we were headed down the shore the next day. One thing led to another and suddenly there were seven different families going; unplanned and spontaneous. And the day was perfect. Warm with not a cloud in the sky. Lots and lots of friends building sandcastles, digging holes, catching clams and crabs. 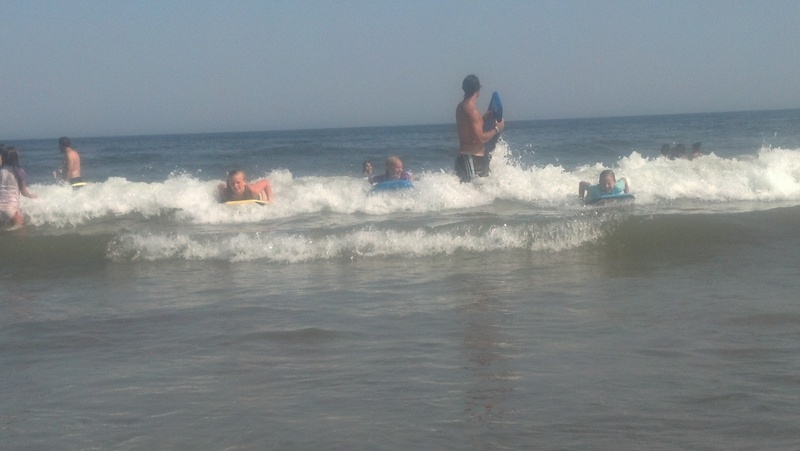 They boogie boarded and surfed (yes it is possible to surf in New Jersey, kind of!) and swam. The adults sat and talked and counted kids, working on the last tan of summer. We swam, applied suntan lotion to kids, and passed out food. The tide went out, the tide came in, and still we remained. No one wanted to leave on such a beautiful day. Then a plan was created; again spontaneously and last minute. We would order pizza for dinner; have it delivered to the beach. The sun set leaving a brilliantly orange and red sky as we ate. Then, over the ocean, the moon rose. A blue moon! The sky darkened and the full moon rose, higher and brighter. 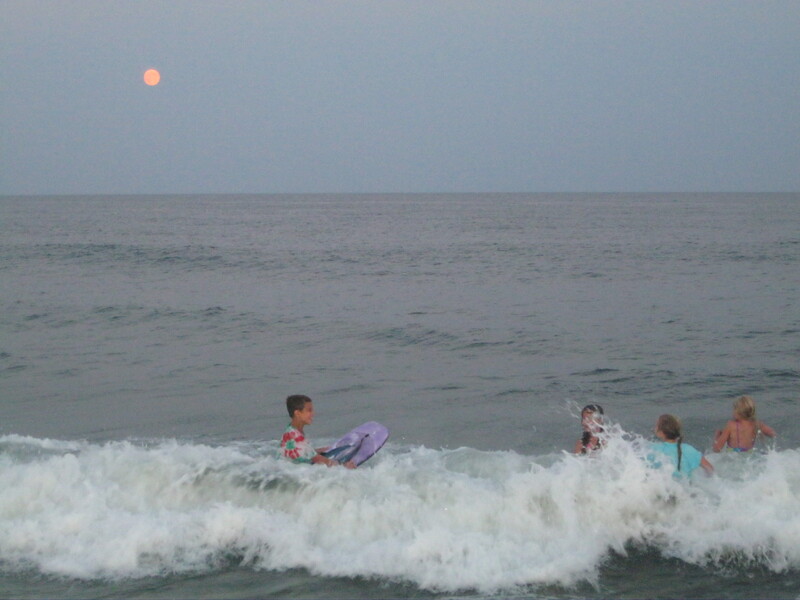 The kids ran into the ocean to swim with the moon. 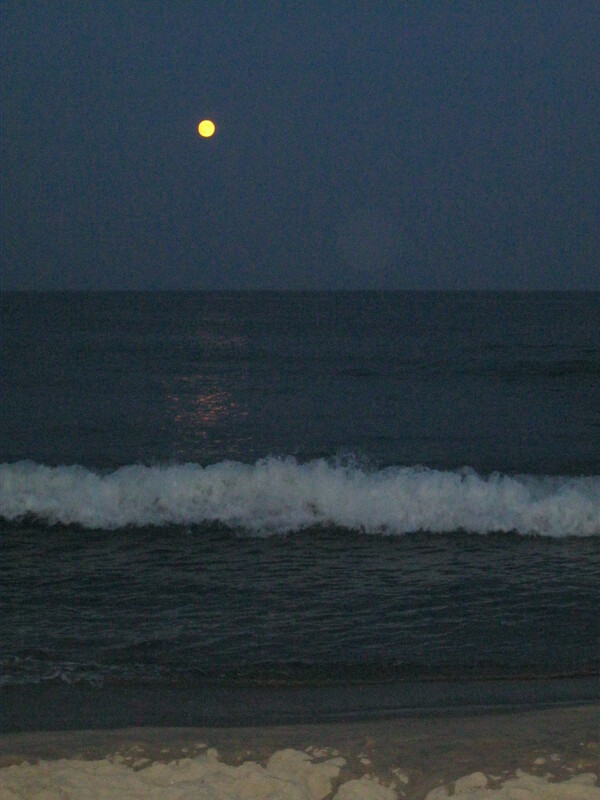 Moonlight shone on them as they laughed and splashed in the warm water. It was a moment frozen in time. Summer may be over and school starting, but right now nothing else mattered. 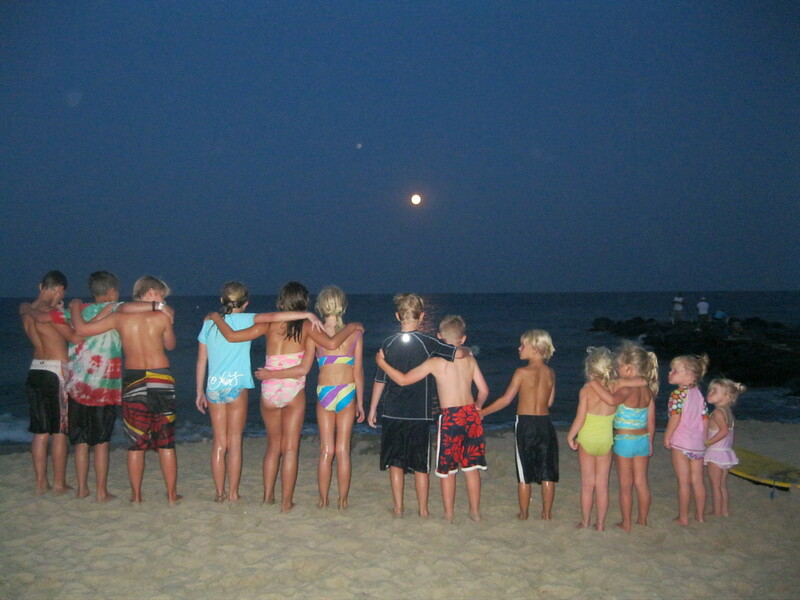 Nothing but good friends and warm air and salty waves in the moonlight. A moment that will carry us through the long dark winter months. A lifetime memory. Heather this blog was sooo enjoyable. I feel like I experienced it with you all. Loved it! It looks like everyone had a friend – what a blessed gift! all of you are so happy ! great pictures and post! esprecially the last picture, love it so much!